During a mission to Germany October 10-17, 1998, the PEA and VEW signed a mutual agreement to execute pilot projects in the field of renewable energy; particularly solar and wind energy. One pilot project is to select a village or two with 20-50 houses in order to be supplied with electricity using photovoltaic cells and wind generators. If proven feasible, the PEA and VEW will be going for larger scale projects in the future. The PEA participated in the workshop organized by the Moroccan Energy and Materials Ministry, which was held during October 26-30, 1998. The workshop was entitled “Sustainable Energy in the Arab Countries: Decentralized Rural Electricity workshop”. The PEA presented a paper about the electrical energy status in Palestine focusing on the renewable energy field. An initial mutual cooperation between the PEA and the United Nations representative was reached in to support renewable energy projects in Palestine. The PEA represented the PNA in the Arab Ministers Council Concerned with Electrical Issues. The task of the council is to promote experience exchange, data collection and dissemination, and unification of the technical terms, specifications and standards. The PEA has initiated direct linkages with the Council’s sub committees. This union plays a dominant role towards development of electricity sector in the Arab World. One of its most important activities currently under implementation is the preparation of an electrical grid map in order to interconnect regionally the Arab countries in the near future. The sub committees of the union is responsible for the coordination and development of the various activities in the fields of generation, transmission and distribution in addition to the development of the different capacity building programs and manufacturing. The PEA is a full member in the union since May 12, 1997 and recently became a member in the board of directors of the union. The PEA participates as a representative of the PNA in the specialized committees of the energy sector which duties are to concentrate on cooperation of Arab states in conserving energy, utilizing and applying the renewable energy state of art. The PEA participates as a member in the energy committee of the ESCWA. The other members of the committee are Lebanon, Syria, Jordan, Egypt, Iraq, Yemen, Kuwait, Bahrain, Qatar, Oman, and the United Arab Emirates. The committee focuses on the issues of regional interconnection, privatization of the electrical energy sector, conservation of energy, and enhancement of the services to the consumers. 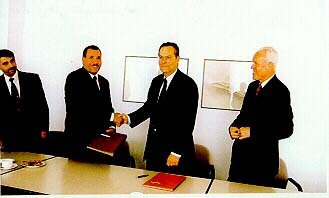 Many meetings between PEA and similar energy bodies in Egypt were held to discuss the cooperation in the field of energy sector development in Palestine, the extension of the Egyptian Natural Gas pipeline project to supply the planned power plant in the Gaza Governorates, and the building of the regional transmission network. The Egyptian Ministry of electricity provided the PEA with capacity building programs in various disciplines. 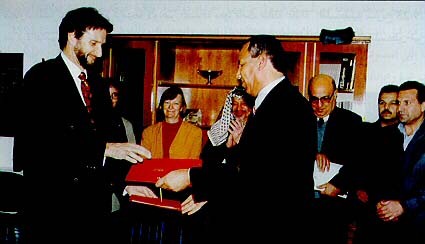 The cooperation with Jordanian Energy institutions was unique in its nature. The PEA signed a bilateral letter of understanding with the Jordanian National Electricity Company on November 1, 1995 which aims to exchange expertise in the fields of design, execution, operation, and maintenance of generation, transmission, and distribution electrical projects. Additionally, the PEA was keen on focusing on renewable energy utilization in electricity generation. It thus signed a contract with the Royal Scientific Society to supply the PEA with two wind turbines used for water pumping. Moreover, four training programs targeted at the technicians and engineers of PEA were held in Jordan. The PEA contacted many foreign countries searching for funding regarding the emergency projects related to the energy sector rehabilitation and development. The following destinations are sincerely thanked for their contribution towards helping the PEA in its short, medium and long-term projections. Norway is considered the largest of the donor countries to provide help and support to PEA in its rehabilitation projects of the energy sector in the Palestinian Territories. Not only did Norway has offered approximately 23 million USD to fund the rehabilitation of the electrical grid in the Gaza Governorates, but also provided 24 Million USD towards the rehabilitation of the electrical network in the North Governorates as well. One of the most important fields in the planning for the energy sector is the policy formulation and institutional setup. The EU has been working closely with the PEA in order to coordinate efforts to layout a fundamental and solid basis for the energy sector on the policy level. Additionally, the PEA became a member in many Mediterranean European committees concerned with energy issues. The EIB was committed to providing 38 million USD as easy loans to fund electric grid rehabilitation projects in mid and south regions of the North Governorates. The World Bank financed the master plan study for the electrical energy sector in Palestine that was prepared by Rust Kenedy and Donken Company in 1995. The study covers all components of the electric system (generation, transmission, and distribution) including the rehabilitation projects for the North and South Governorates. The World Bank is committed to offering 15 million USD as an easy loan towards the rehabilitation projects in the Palestinian Territories. The Electricity Supply Board International (ESBI) offered management and technical training programs. The project consisted of group training in Palestine and Ireland. It was approximately presented to forty PEA managers and engineers. The Belgium government is committed to donating 7.5 million USD to finance the electrification of about 30 villages in north the West Bank. It has also promised to supply Nablus with distribution transformers summing to 400,000 USD. The Government of Italy was committed to 24 million USD as a loan to finance the project for rehabilitation of electric network in mid and south the North Governorates. Initially, SIDA was committed to offering 30 million USD to finance the high voltage transmission lines project to be built in the South Governorates. The Japanese government through JAYKAI institute financed four training courses to the engineers and technical staff of the PEA and the municipalities in the North and South Governorates. The training courses were held in Jordan. The Government of Japan is also involved in assessing a study to supply electricity used for domestic appliances to a group of villages in the North Governorates (YA’BAD PROJECT). In addition, it studies the potential of taking part in the rehabilitation of the electric grid in the South Governorates. The French government promised to fund a project whose aim is to lighting nine (9) villages in the Qalqilia area (north of the West Bank) totaling to 2.5 million USD. The Canadian government studies the feasibility of building a power plant in north of the West Bank. A report was submitted recently to the PEA for assessment. The Czeck government is financing the first three stages of four stages constituting a project to electrify 25 villages in Tobas, the West Bank totaling to 4.5 million USD.